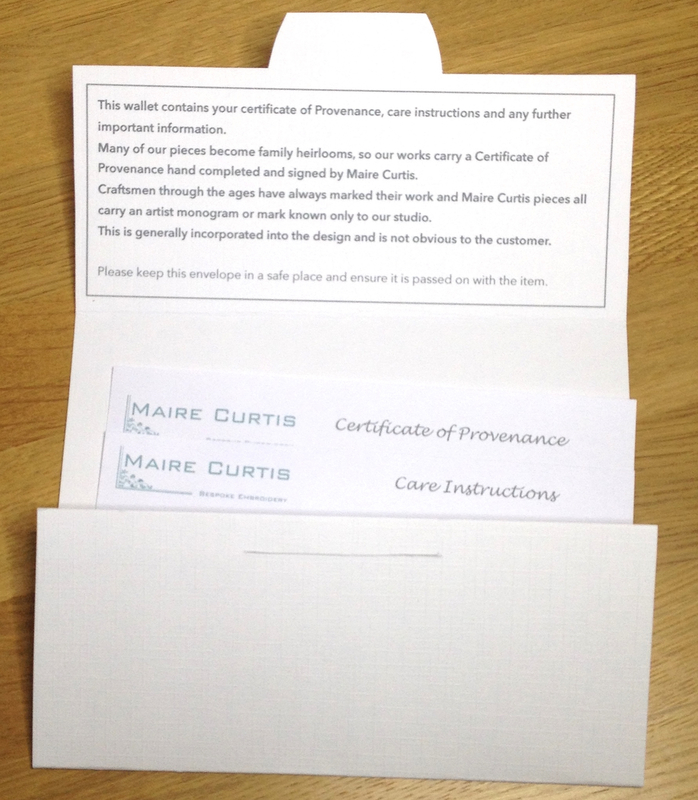 Bespoke and limited edition items created by the Maire Curtis studio all arrive with a signed and numbered certificate of provenance ensuring you of authenticity. Craftsmen through the ages have all marked their work and our hand embroidered items carry a unique mark which is incorporated into the design and known only to our studio. This mark or ‘studio signature’ differs with each design and is not evident to the end user. Each item will also have care instructions enclosed to allow you to keep it clean and stored safely. Bespoke items are packaged in a white presentation box lined with acid free tissue paper to ensure it is stored in the best environment. We may sometimes include a pack of moisture absorbing Silica gel.